Program host and medical expert Maurie Markman, MD, interviews Anya Khomenko, a patient impacted by an advanced diagnosis of ovarian cancer, and her gynecologic oncologist, Justin Chura, MD. Together, the panelists explore treatment advances in the disease and remark on their potential impact in improving outcomes for patients. Anya Khomenko, survivor of ovarian cancer, explains how she believed she would soon die following her diagnosis. Justin Chura, MD, highlights how the outlook has improved for patients. Justin Chura, MD, and Anya Khomenko, survivor of cancer, remark on later-stage diagnoses in ovarian cancer and the wide range of nonspecific symptoms that can occur, advising viewers to pay attention to warning signs. Justin Chura, MD, discusses the role of the gynecologic oncologist in establishing an initial treatment plan for newly diagnosed patients with ovarian cancer and helping patients, such as Anya Khomenko, prepare for every step along the way. 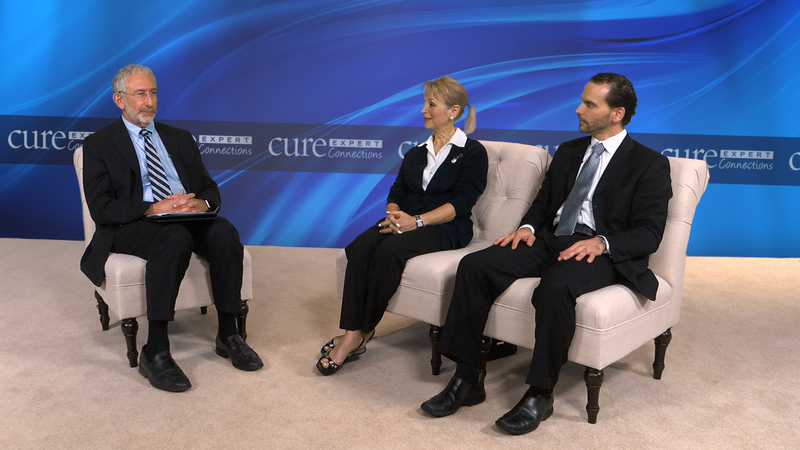 Justin Chura, MD, and Anya Khomenko, survivor of ovarian cancer, reinforce the value in patient education and reflect on the importance of seeking a second opinion from an expert in ovarian cancer prior to beginning therapy. Justin Chura, MD, discusses his initial approach to treating ovarian cancer. Anya Khomenko, survivor of ovarian cancer, advises patients on how to become educated on new therapeutic options and prepare for follow-up appointments. Justin Chura, MD, explains how gene mutations play a role in ovarian cancer, and remarks on new opportunities in treating ovarian cancer with PARP (poly [ADP-ribose] polymerase) inhibitors. Justin Chura, MD, provides an overview of maintenance therapy in ovarian cancer and discusses the role for PARP inhibitors in this setting. Justin Chura, MD, explains his protocol for monitoring patients for recurrence and discusses how he talks to patients about maintenance therapy versus surveillance. Anya Khomenko reflects on her journey as a patient and survivor of ovarian cancer and suggests why patients need to advocate for themselves and remain positive that there are always new treatment options on the horizon.